We have customers ask us all the time if we had anything for mosquitoes and finally the answer is YES. 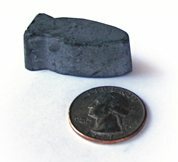 The product is the PreStrike® Mosquito Torpedo® which is a little fish shaped tablet you put in all locations with standing water and they prevent mosquitoes from reproducing. Mosquito Torpedoes are more effective than the common Bti mosquito dunks you buy in hardware stores. Torpedoes can stop 95% of mosquitoes from successfully developing where Bti dunks stop roughly 35%. Simply plop them in all water troughs, ponds, stock tanks, etc., and you're protected for 60 days. For horse owners there are two big advantages to Mosquito Torpedos; they're approved by the EPA for animal drinking water (dunks are not) and they sink to the bottom so they don't become snack food. They also don't cloud the water, or have particles floating on the surface as hardware store Bti dunks do. These have been widely used for years by the professionals of mosquito control, FEMA, DOD and County Mosquito Abatement Districts (aka Vector Control), but not widely available in retail. The active ingredient in Mosquito Torpedoes (S-Methoprene) is an IGR (Insect Growth Regulator) that affect mosquitoes at every life stage prior to emergence eliminating their ability to develop to the next stage thus never becoming adults. The ingredient is very specific to Mosquitoes and does not harm any creature with a spine. So it's safe for people, livestock, fish, frogs, birds, etc. Torpedoes are approved for use in stock tanks in the US. In many tropical countries with severe mosquito (and hence malaria) problems they are used in human drinking water. One little Mosquito Torpedo will provide protection for 60 days in up 100 square feet of water 2 feet deep (1500 gallons). If your pond is larger put two or more Torpedoes in. If you put them in a smaller tank, such as a horse trough, bird bath or a smaller pond the Mosquito Torpedo will last much longer, perhaps all summer. The Mosquito Torpedo gets smaller as it slowly releases S-Methoprene. If you can still see it, it's providing protection. Another advantage over hardware store dunks it that the pond or tank can dry out, and if the Mosquito Torpedo is still present, it will start protecting again when the tank or pond refills. 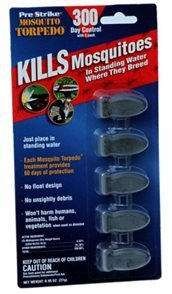 Five Mosquito Torpedoes come per package for $9.49. Survey all the locations on your property and get enough to protect every one. Prevent mosquitoes from starting by using Mosquito Torpedoes before mosquitoes are a problem.